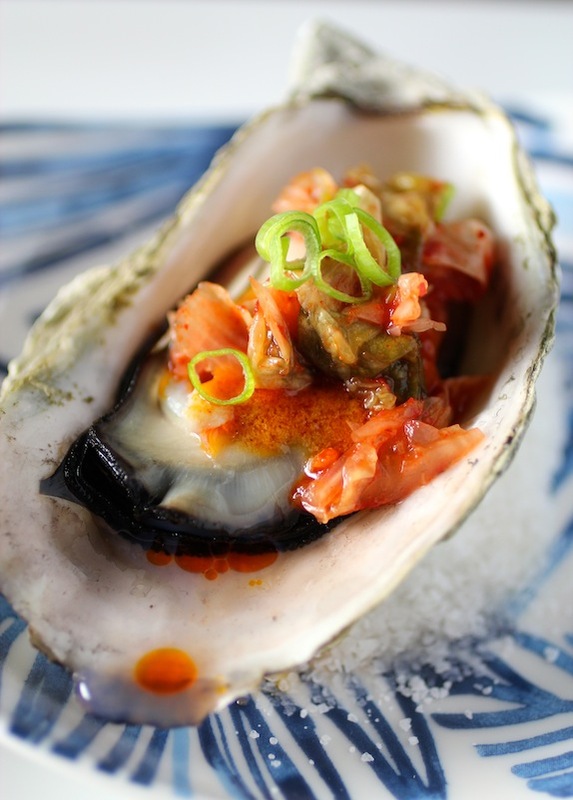 Let’s not pretend that these BBQ oysters will appeal to everyone. 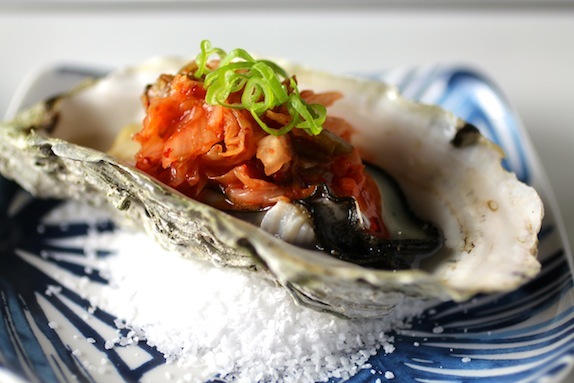 But surprisingly, those who said they were not fans of bivalve molluscs nor fermented cabbage found themselves enjoying several of the Korean Style Oysters hot off the grill. 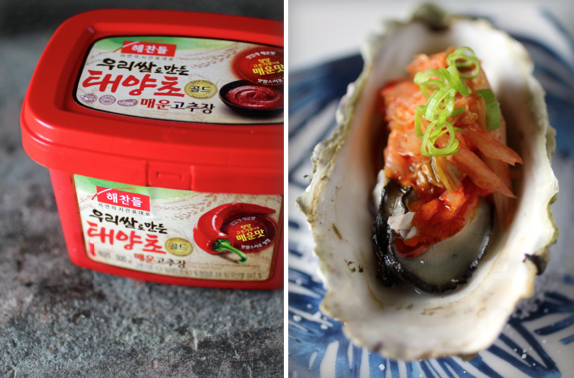 At a recent party, we served Fanny Bay Pacific Oysters boldly dressed with Korean flavors – a spicy rich gochujang butter, complex kimchi, and fresh scallion. And paired with cold Hite lager to get the party has started! Fanny Bays are hefty and beautifully fluted, the meat is smooth with a clean cucumber finish. The town of Fanny Bay is located on the inner coast of Vancouver Island, British Columbia, Canada. They’re one of our favorites, meticulously farmed… you rarely get a bad Fanny. 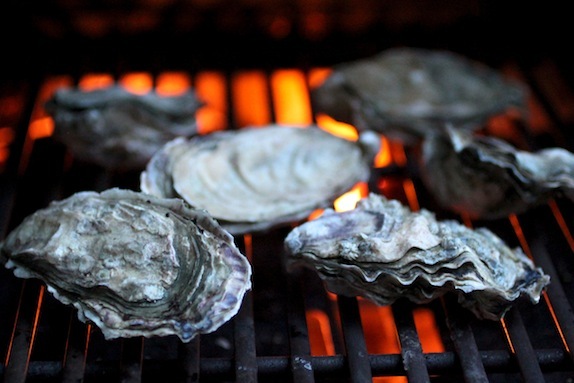 Place rinsed cold live oysters on a hot grill, cup side down, for about 3 to 4 minutes until they pop and sizzle. Use tongs to remove the hot oysters from the grill. Then use a folded kitchen towel to stabilize and hold an oyster, protecting the hand holding the oyster. Insert the tip of the oyster knife into the pointy end, next to the hinge. Wiggle the knife into the oyster then twist the knife to pop the shell open. Wipe the knife clean to remove any bits of shell clinging to it. 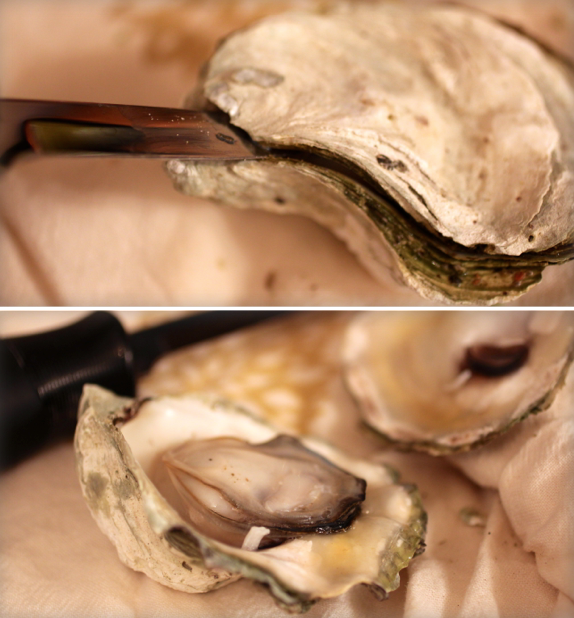 Then use the knife to cut the muscle that holds the oyster meat to the shell. In a small sauce pan, melt one stick of butter then whisk in 2 T. gochujuang (Korean red chili paste). Let the butter cool down, whisking occasionally, to get a homogenized mixture. Keep warm, but not hot, to prevent it from separating. Place a mound of Kosher salt on small plates. The salt will make a stable bed to hold the fluted shells upright. 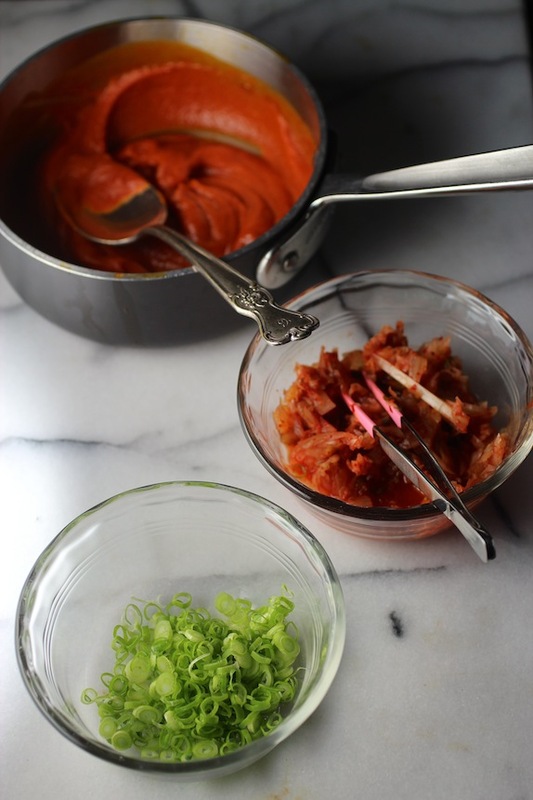 Slice napa cabbage kimchi into thin ribbons. Slice scallions very thin. Make sure to have the toppings ready to go before grilling the oysters. 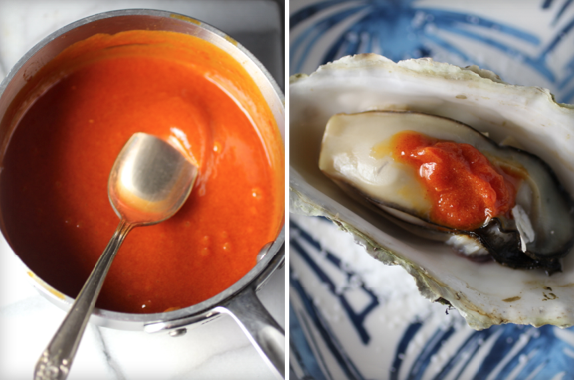 Top the hot shucked oysters with a dollop of warm gochujang butter. Place a small mound of kimchi on top, finish with a sprinkling of the scallions. Serve immediately. 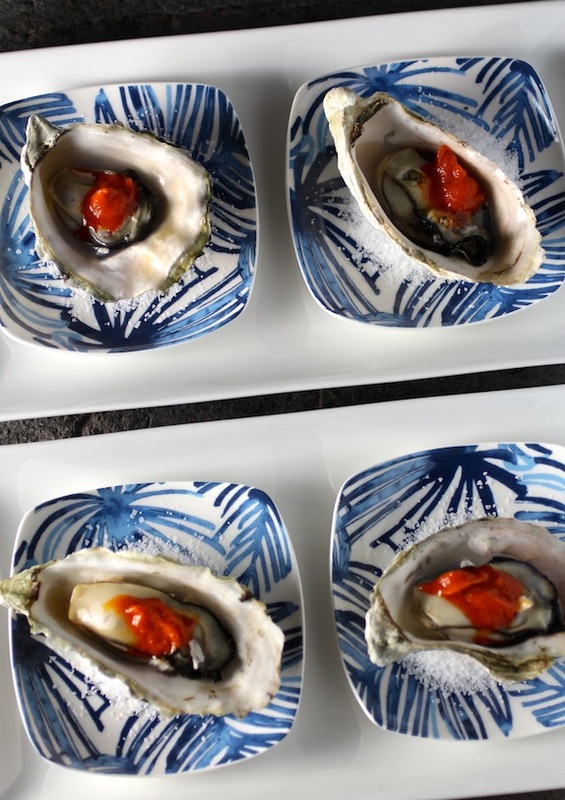 In fact, it’s fun to have a production line – as oysters are ready to come off the grill – shuck, dress, and serve them to the guests huddled around the BBQ. 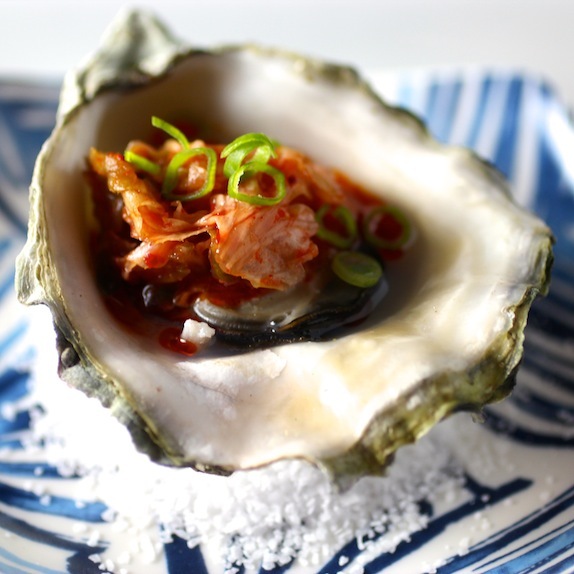 Each oyster cooks in its own time, depending on size, and the hot spots on the grill. Wow! You definitely know how to serve oysters. Love it. I don’t really care for raw oysters, much to the disappointment of the hubs, but I bet I would love these! Interesting that you toss them on the bbq to cook them before opening. Clever. 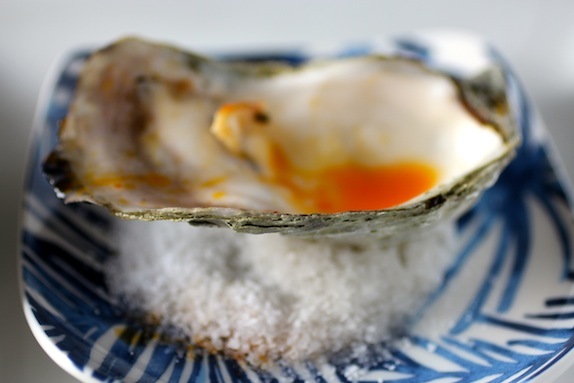 LL – you manage to make oyster looks beautiful. I need you to come and do a make-over on me. This is a unique way to serve them, – no doubt about it – but it seems as if this absolutely works. I love the Korean recipes – there are so many ingredients I cannot easily get (I know – that’s what online is for) but you really tantalize my taste buds. I have had a love affair with oysters since I was a teenager: well, that is not difficult when you live in Sydney Down Under 🙂 ! Prefer them au naturel mostly, but in my earlier years tried all other kinds, or so I thought until I read this post! Korean-style: had never heard of anything vaguely like it [but why not!!] . . . curious now, have to try this as soon as possible 🙂 ! Ever since I received the email about this recipe (and forward to my husband who loves oysters), we’ve been talking about making this. I’m not a big fan of oysters, but this looks really good! Perfect for entertaining our seafood lover friends! I love your pictures, LL. This will be a very exciting bbq ingredient this summer. I don’t have to pretend. I’m a fan and I love this Korean version. I’m getting ready to grill some oysters. I hope they are just as good as these puppies look. Can I order a dozen please? WOW! These look delicious! I love the way your grilled them then opened them. I’m sure that kept them quite moist. I usually find cooked oysters quite dry, but yours look perfect! What a great bite of heaven!